Sir, i was compleated B.com in distance education without inter so can i eligible to VRO post. Re: What is the eligibility criteria for VRO post? The aspirant who wants to apply for the AP VRO position should not has crossed the age of thirty four year and should has completed the age of eighteen years. If you are want to apply for the A.P. V.R.O. Post then your Education qualification minimumly should be an intermediate class or twelth class pass from A.P. Education Board or its Equivalent. NOTE: You should be native of Andhra Pradesh State. ~ You have to be completed your Intermediate (12) conducted by Andhra Pradesh Examination state Board of Intermediate Examination. Shall be native of the district for which the recruitment is notified. EDUCATIONAL QUALIFICATION:You should completed with your intermediate i.e 10+2. Age limit:you should be between 18 to 35 years old.relaxation will be there for sc/st candidates(5 years relaxation). written test consist of 100 marks of objective type questions. and should has completed the age of eighteen years. VRO syllabus in telgu if you want you can refer below.. Eligibility:- For apply VRO exam candidate should be pass 12th. Age of candidate should be between 18 to 35. Relaxation for sc/st is 5 year . Selection is the basis on written test. The written test will be in the form of objective questions. The paper will be 100 marks 60 marks for General Studies and remaining 40 marks will be arithmetic and logical ability. i have passed intermediate in one sitting of APOSS,so i am eligible for vro post? I am sorry to tell you, you are not eligible for this post. This exams are conducted by state revenue boards. You must have 12th with any stream. And your age limit is 18 - 35yrs and here Relaxation for sc/st is 5 year . But you don't have above qualification.So, you are not eligible for this post. 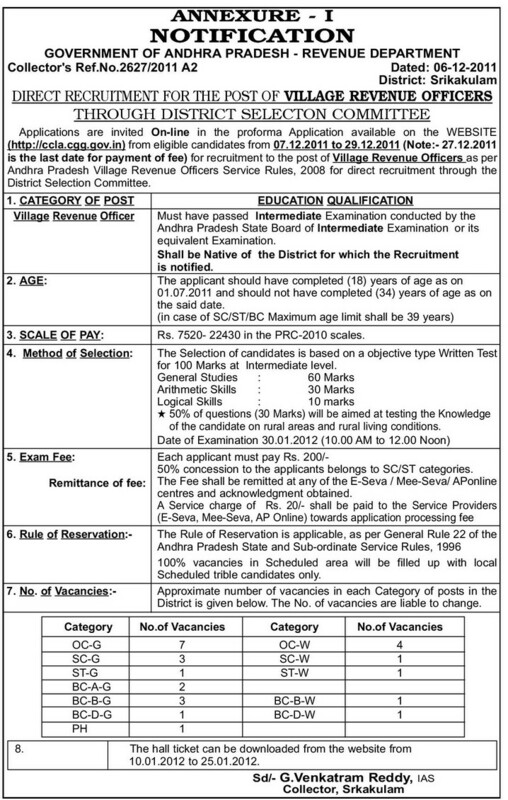 VRO stands for village revenue officer.if you want to apply for VRO post then you must be completed your intermediate then only you can apply as the minimum educational qualification required is intermediate. You are eligible so you can apply for this exam. for sc/st candidates (5 years age relaxation). General studies section consist s of 60 marks in that 30 questions will be village development issues . Selection of candidates is based on an SSC level objective type Written Test for 100 Marks. 5 years for SC/ST categories. 3 years for OBC categories. 10 years for physically handicapped categories. So these are the complete details of the VRO posts.Coming to the pay scale the starting pay is 7500/- and the maximum pay is 22450/-.So the complete details are clearly mentioned. Please refer the APPSC Website for notification details. VRO refers to Village revenue officer, for this post the examination is conducted by the respective state commission. Your's completion of intermediate from an recognised board is necessary otherwise you will be not eligibile for it. The age of your's must have to be in the limit of 18 years to 34 years. You will also be given age relaxations if you are from the reserved category. You must apply for written examination which is generally the objective type paper. Once you qualify it, you will be called for the interview. The maximum era limit can be 34 years. Era leisure is supplied with regard to set-aside categories. 5 several years with regard to SC/ST categories. three years with regard to OBC categories. 10 several years with regard to in physical form inept categories. So fundamental essentials finish information of your VRO posts.Coming for the shell out machine the actual beginning shell out can be 7500/- plus the most shell out can be 22450/-.So the whole info is definitely mentioned. Be sure to recommend the actual APPSC Internet site with regard to alert details. VRO is the term for Hamlet revenue police officer, with this post the actual assessment is accomplished through the particular express commission. Your's realization advanced beginner via a good acknowledged aboard is necessary otherwise you will end up not really eligible with regard to it. The era of your's should must be within the limit connected with 18 several years to 34 years. A person can also be provided era relaxations should you be through the set-aside category. You must submit an application for composed assessment and that is usually the aim sort paper. As soon as you qualify that, you will end up required the actual interview. EDUCATIONAL QUALIFICATION:You need to finished along with your intermediate i.e 10+2. Age limit:you ought to be between 18 to 35 decades old.relaxation is going to be there for sc/st candidates(5 decades relaxation). prepared check contain 100 marks of goal form questions. candidates who have completed their intermediate with atleast 60% of the marks are eligible to apply for the post of VRO. The exam is conducted for 200 marks.The exam pattern of VRO exam is in the following manner. selection of candidates is based only on written test.There is no interview. 4) regional language is compulsory .